Memory Styx is a one-day drawing masterclass open to young people between 16-24. 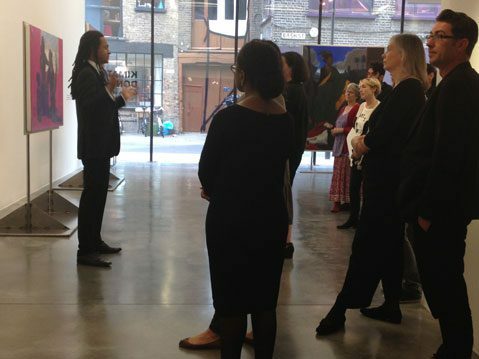 This is a unique opportunity for young people to work directly with the artist Kimathi Donkor, whose current exhibition Queens of the Undead is showing at Rivington Place. Kimathi Donkor’s dramatic large-scale paintings express pathos, wrath, devotion and irony. Donkor explores portraiture, identity and narrative in his paintings, creating a body of work inspired by a combination of historical action and personal memory. Developed from drawings, Donkor’s work is constructed through extensive research and exploration into both public and private memory. Learn how to explore this relationship between art-production, history, memory and drawing in this unique practical session. The masterclass will provide a thorough insight into Donkor’s practice and inspirations, a tour of the exhibition by the artist himself, as well as practical tasks and discussions. Limited spaces available. If you are aged 16-24, and studying an art-related course, you can book online here. If you have inquiries, please call 020 7749 1240 or email bookings@rivingtonplace.org.